CAPE TOWN, South Africa — Barack Obama, America’s first black president, twice crossed the cold and deep 9-mile channel that lies between this magnificent coastal city and Robben Island, where South Africa imprisoned its first black president, Nelson Mandela. The last time Obama stood in the stone cell blocks and peered out of the barred windows was in June 2013, during a presidential visit to South Africa. Before that, in his first visit in 2006, Obama was a first-term United States senator. History sits heavy on this rocky, wind-tortured island of scrub and penguin nesting grounds, as it does in all of South Africa. Along with Mandela, South Africa’s current president, Jacob Zuma, also was imprisoned here for crimes meant to foster a national movement to end white control over the black majority. 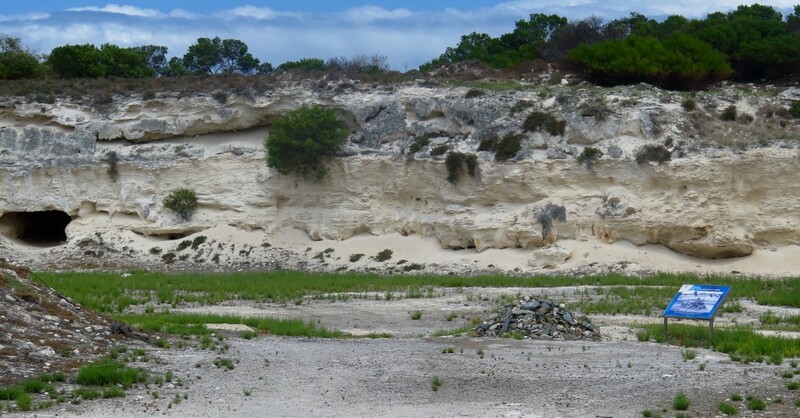 Robben Island, shadowed by the immensity of Table Mountain and within easy reach of Africa’s wealthiest and most cosmopolitan city, may be the oddest presidential training ground in human history. South Africa, though, is like that. The glory of the natural landscape is like a blindingly beautiful drape hiding the ragged, fractured geography of South Africa’s culture and economy. Having thrown off the racist white government in 1994, and elected Mandela and other capable black leaders to positions of authority, South Africa seemed to surge forward. Schools, housing, transportation, access to medical care, and incomes improved. That momentum slowed earlier this decade and lately may have been jarred into reverse. Scandals and corruption accusations surround Zuma and his government, which has been weakened by cabinet shake-ups. A constitutional crisis is unfolding prompted by the president’s use of public funds to enhance his private estate. The rand, now worth barely 6 U.S. cents, has slid to its lowest value ever. Unemployment has soared to more than 35 percent. Economic growth may slip into negative numbers this year. A deep two-year drought could lead to the biggest crop failure in South Africa’s history, leading to a 25 percent increase in the price of food, and perhaps food shortages. Crime is ferocious everywhere. Measured in pure economic terms, black South Africans are losing ground and they know it. In 1948, when white nationalists took command of the country, the top 1 percent of wage earners controlled 22 percent of South Africa’s wealth. By 1975, as the freedom movement gained momentum, the top 1 percent controlled 10 percent of the wealth. Today, South Africa has regained its ignominy as the most unequal economic society in the world. According to the most recent analysis, the top 1 percent again control 20 percent of the wealth as they did in the 1940s. Some 80 percent of the top 5 percent of wage earners are white. The top 10 percent of wage earners control 60 percent to 65 percent of all wealth. That’s higher than the United States, where the top 10 percent control 40 percent to 45 percent of the wealth. After nearly two months of reporting here on the high veld and Wild Coast, the desert Karoo and the irrigated KwaZulu-Natal sugar plantations, in the informal settlements of Durban and Emalahleni, in deteriorated Pongola and Paulpietersburg and Graaff-Reinet, it seems plain to me that it will take at least another generation for South Africans to sort out these endemic problems. Some are founded in penetrating conflicts of race and incapable leadership. All need attention to ensure that the promise of that 1994 election of liberation really takes hold. Odd as it seems Robben Island is a kind of seaborne beacon, a big marine bouy and clanging bell of South African endurance and persistence, that can guide this nation through the storm of trouble it’s encountered. South Africans, especially black South Africans, hold in their spirits deep reservoirs of patience and compassion. They are expressed in gestures of grace and understanding that can distill grievance and fury into emotions that are much more righteous and valuable. That surely describes the legacy of Mandela, a trained lawyer who became a revolutionary dedicated to emancipating his nation. He was imprisoned for treasonous acts for 27 years, 18 of them spent on Robben Island, where he spent his days pounding limestone with a hammer, and his evenings in a cell so small he couldn’t fully extend his legs while sleeping without hitting his head. Turning malice into a new thought also is Kgotso Glen Ntsoelengo’s story. He was convicted by the Apartheid government of sabotage and served his seven-year sentence on Robben Island starting in 1984. Ntsoelengoe was released in 1991, following years of secret negotiations to free political prisoners between Mandela and the governments of two white Apartheid leaders — P.W. Botha and F.W. DeKlerk. Ntsoelengo, who was convicted and imprisoned as a very young political activist working for black South African freedom, is a thick, middle-aged, and reasoned husband and father now. 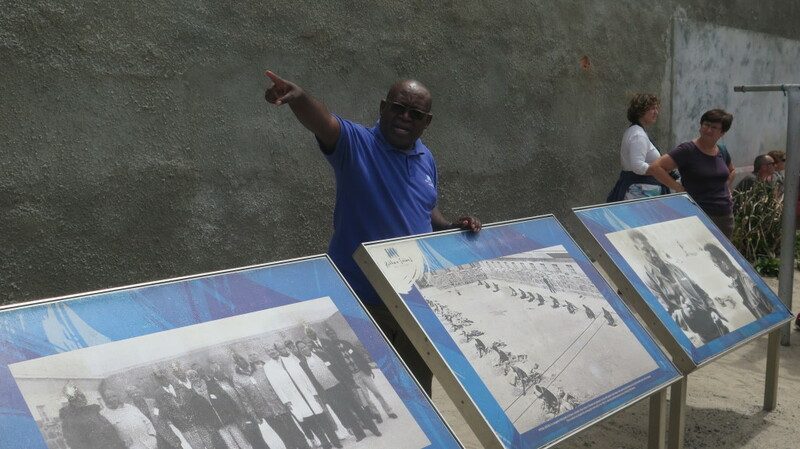 He also is one of 12 former Robben Island political prisoners who serve as tour guides in a place as emotionally wrenching as Dachau or Auschwitz, that also summons the best of our capacity to be inspired by justice and dignity. In the hour that a group of 30 visitors spent with Ntsoelengo he told us of the various cell blocks that held up to 1,250 prisoners at a time, but were not over-crowded. He explained the arduous work that began before dawn and ended before dusk, and the meager clothing, cheap food, cold water, and spare bedding provided by the racist and worried Afrikaner regime. Visits by family members were infrequent as were letters out or in. Any breaches of embedded rules, or insolence, would be met with days in solitary confinement with scant food. 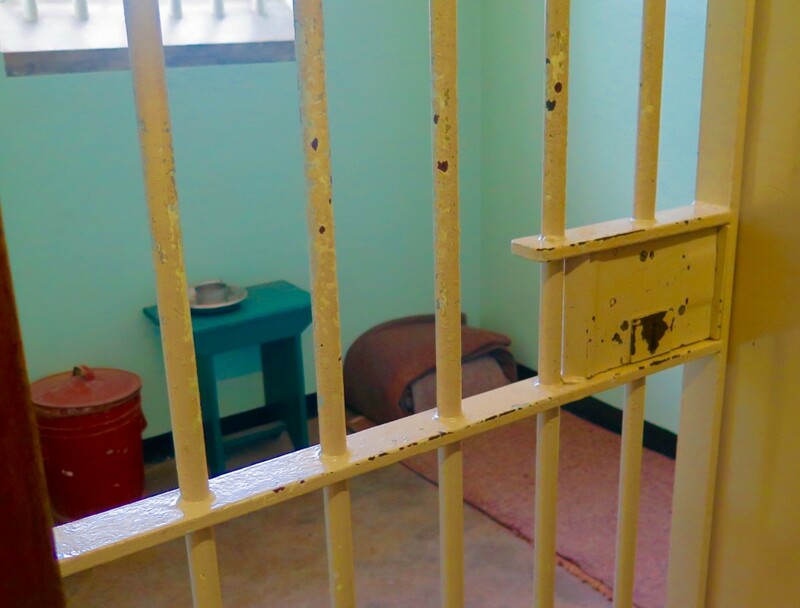 Many prisoners, said Ntsoelengo, were sentenced to long prison terms, frequently life terms. But because of the growing influence of the fight for freedom, and the national and global prominence of some of Robben’s current and former prisoners — Mandela, Walter Sisulu, Robert Sobukwe – the other political prisoners were convinced they would eventually be freed. That conviction kept prisoners alive with hope for themselves, their families, and their country. There’s a straight line of courage and conviction that runs from Mahatma Gandhi to Martin Luther King Jr. to Nelson Mandela to Barack Obama. There’s also a straight line of leadership that runs from South Africa to the United States. Gandhi spent 21 years from 1893 to 1914 refining his non-violent approach to political advocacy in Durban, where he established the Phoenix settlement. 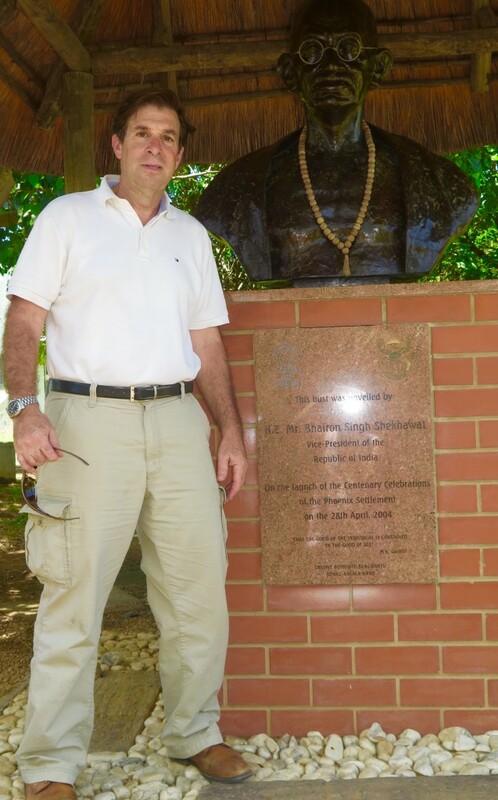 Mandela visited the Gandhi settlement, now a national historic site, before casting the first vote in the 1994 national election. Barack Obama twice sought the austere confines of Robben Island to also honor that straight path to justice. Obama’s guide through the prison during his first visit in 2006: Kgotso Glen Ntsoelengo.